Henri Cartier-Bresson’s legacy of the “decisive moment” had a profound impact on photography. As a cofounder of the photographic cooperative Magnum Photos in 1947, his philosophy influenced a whole generation of photojournalists, and, for decades, Magnum photographers were instrumental in constructing the popular impression of reality. They crafted a collective memory of history as a set of succinct narratives told through images captured in the briefest of instants. “Trace Elements” was born out of the 2006 Australia-Japan Year of Exchange, which saw hundreds of events take place in the two countries. Two key exhibitions were “Re:search — Art Collaboration between Australia and Japan” held at the Sendai Mediatheque and “Rapt! 20 Contemporary Artists from Japan,” held at venues across Australia. Several of the artists in “Trace Elements” encountered each other during these two exhibitions. Some of the works in “Trace Elements” elucidate issues of national identity. In “Picturing the Old People” (2005), Genevieve Grieves exposes the construction of Australian aboriginal history through the contrivances of portrait photography. Five videos shown side by side replicate black-and-white archive photographs of indigenous southeastern Australian “Koorie” people posing as “aborigines” for the camera. In one, set against the backdrop of a painted landscape a Caucasian man in a suit and a bowler hat instructs seminaked Koories to wear furs and brandish shields and spears. They look perplexed. Although Grieves’ work happens to address the issues of memory and identity through the prism of Australian cultural and social history, the scope of “Trace Elements” as a whole goes far beyond issues specific to Australia and Japan. Its themes are common to all people, regardless of origin. Lieko Shiga and Seiichi Furuya draw on their personal experience to explore unseen social borders in the European countries they live in, creating their own realities, timelines and memories. Furuya moved to Graz, Austria, in 1973, and his work has dwelt on his relationship with his son, Komyo, and on his wife, Christine, who committed suicide in 1985. The scattered display of 70 photographs is a poignant visualization of the fragmentary nature of memory, fluctuating between moments of happiness, calm, anxiety and misery. Not adhering to any strict chronology, Furuya’s arrangement of photographs is an after-the-fact reconstruction of the 7 1/2 years he lived with his wife and the two decades since her death. As he has been away from Japan for so long, Furuya feels he has lost touch with what it means to be Japanese; his present identity is caught between Europe and Japan, so he has centered his photographic reconfigurations on immediate family surroundings in order to anchor his sense of self . As much as the exhibition “Trace Elements” at Tokyo Opera City Gallery focuses on the nature of memory, it is a meditation on the vulnerability of the human body. The scientific meaning of trace elements is “a chemical element that is needed in minute quantities for the proper growth, development and physiology of an organism,” such as the lithium, lead or arsenic found in our bodies. Ultimately our recollections of the past are purely products of neurochemical processes powered by these and other chemical elements. Appreciation of this physicality is embodied in Sophie Kahn’s “Head of a Young Woman” (2007-08), a finely cast bronze sculpture of a layered, fragmented face. Exhibited with a series of black and gray lambda prints depicting the female form as a fragmented set of spatial coordinates, “Head” is a sculptural product that presents traces of Kahn’s own body as an art object. The work stands out for its solidity and stillness at the gallery, functioning as an essential anchor in the midst of so much ephemeral light and movement. Shiga, who won this year’s Ihei Kimura Photography Prize for her photography books “Lilly” and “Canary,” is showing three series of past work: “Jacques Saw Me Tomorrow Morning” (2003), “Damian Court” (2004) and “Lilly” (2005). 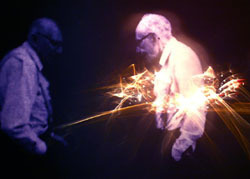 In “Double Robert” (2004), an old man, slightly slouched, is seen in duplicate, one figure a darkened reflection of the other. 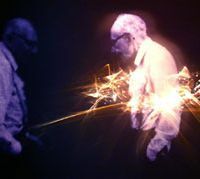 On the right, a dancing constellation of light forms explodes out of his body. The mood of the work is bittersweet, its composition balanced by the doppelgangers of life and death. All three of Shiga’s series were made in London housing estates in rundown neighborhoods. Shiga has described the intense difficulty of overcoming the fear of approaching her neighbors to photograph them in the ethereal scenarios that characterize her work. Without sentimentality, she injects playful magic and poetic poignancy into the gloom of this side of London. Sound is a significant factor in the exhibition’s exploration of space and memory. Shiga has been lucky both here and at “Re:search” to have her photographs situated next to video installations with soundtracks that complement the mood of her imagery. At “Re:search” it was Alex Davies’ work, “Swarm” (2003); here it is Philip Brophy’s “Evaporated Music (Part I a-f)” (2000-04). Brophy has taken pop-music videos from the ’80s and ’90s, stripped them of their original soundtracks and replaced them with orchestrated soundscapes of crackles, reverb and crashes. Elton John’s singing in “Sacrifice” is drastically reconfigured into a rasping gasp, sounding more like the voice of Satan emanating from an LP being played backward. Similarly, Brophy has taken the over-stylized sentimentality and sexualization of videos by female singers — picture Celine Dion wandering forlornly through a haunted manor house on a stormy night and Mariah Carey swinging seductively on a tire suspended over a lake — and rendered them sinister and aggressive. Davies has also set out to make viewers think twice about their perception of sound and its relation to images. In “Dislocation” (2005-06), four small screens are set in holes at chest height in the wall. As you stoop to peer into them, you see that you are being filmed from behind. This live footage is merged with prerecorded footage of a variety of characters who enter the gallery to perform unexpected or inappropriate acts for an art gallery: A young woman talks on her cell phone; a man creeps up behind you and invades your personal space; another snatches a handbag from a woman. The more real visitors you have together with you in the gallery, the harder it becomes to separate the live footage from the prerecorded as everybody mills around. Unfortunately, the impact is muted by the wooden acting of the actors. The woman who has her bag stolen doesn’t seem sufficiently shocked and chases after the thief only halfheartedly. The most successful, unnerving moment comes not from a human figure but an attack dog, brought in on a leash by a riot policeman. The dog’s aggressive bark triggers instinctive reactions of fear and defense — the empty space suddenly becomes charged with urgency though the threat exists only in the memory. Unlike Cartier-Bresson’s legacy — the neatly packaged instants of emotion that have spawned countless imitators — work in “Trace Elements” is less susceptible to stylistic imitation. Though its drawn out, somber and inconclusive presentation of time and memory fills one with unease, it is an invaluable opportunity to see artists probing the nuts and bolts that secure our understanding of reality.